Q: Should you invite coworkers to your wedding? Toni D: I believe it depends on how close you are to your co-workers. If you are close to several, go out socially, and if the budget allows it, ask them. Q: What if there are some coworkers I want to invite, but not others? Toni D: You may tell your other co-workers there is a limit to how many people you can invite to your wedding. Q: What if all your coworkers chipped in for a wedding present? Toni D: If everyone at the office chips in to buy you a wedding present, then everyone should receive a personal thank you note. This is a thoughtful way to share you care about your coworkers. Q: What if a coworker is angry with me for not inviting them to the wedding? Toni D.: There will always be hurt feelings with someone, but it is your and your man’s day. Don’t let other people ruin it. Thank you Toni for sharing your great advice with us! "It is unnecessary to emphasize the menace of the drunken driver; certainly there is nothing to be said in his defense, nor can anyone want him to escape the full penalty of the law." "The kitchen should be returned to its rightful tenant, the cook, in just as good order as it was turned over to the family when she went out. The same is true of the pantry and even the dining room." "It is always proper for a bride to wear a white dress and veil, no matter in what season of the year the wedding is held. It may be of any white material, satin, brocade, velvet. chiffon, or entirely of lace. It may be embroidered with pearls, crystals or silver; or it may be as plain as a slip-cover. It may be anything in fact that the bride fancies, and may be made in whatever fashion or period she chooses." I'll be featuring random passages occasionally on the blog - if there are any topics of interest to you, please post a comment! Heather and I recently attended the Association of Bridal Consultants’ annual conference in Indianapolis. We met a lot of great people, and attended some very informative classes. One of the highlights of the conference for me was meeting Peggy Post. 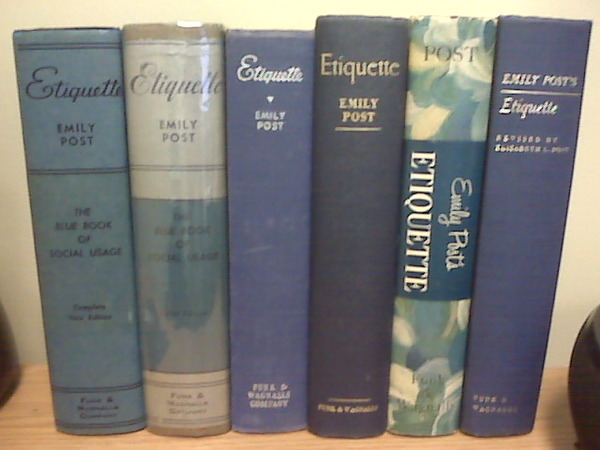 That’s right, Peggy Post, the great-granddaughter-in-law of Emily Post – etiquette guru! I attended two of Peggy’s sessions at the conference, and learned some really interesting things about etiquette and how it changes between cultures and over time. One thing that really stuck out to me was that the giving of a thank you gift can differ between cultures. The type of gift, when to give it, when to open it, and the appropriate way to reciprocate the gift can all vary depending on the culture. For instance, be cautious if giving flowers as a gift. Different colors or types of flowers have various meanings depending on the culture; some even symbolizing death. What I found even more interesting (and not surprising) is that chocolates are the universal thank you. My favorite part of Peggy’s presentation, (besides her calling wedding coordinators saints) was her showing how the principles of etiquette have changed over time. In 1922: A bride-to-be could not accept apparel, a house, or a car from her fiancé. A wedding in the evening would never take place in New York. A sit-down breakfast reception was the norm. Southern weddings took place in the evenings (because the weather was typically cooler). In 1980: Female guests should never wear white or black to a wedding. A woman who is re-marrying should never wear white. A bridal gift registry could only consist of crystal, silver, china, and linen – that’s all! The bridal party could only consist of men standing with the groom and women standing with the bride. Now in 2009, we have honor attendants or even pets as participants in the bridal party. It is acceptable for female guests to wear black; sometimes even the bridesmaids' dresses are black. And bridal registries often consist of just about any household item, even camping gear and flat screen TVs. Not to mention the option of having a honeymoon registry, or requests for charity donations in lieu of gifts. I also found it interesting that the one rule of etiquette that has not changed in over 80 years is the sending of a hand written thank you note after receiving a gift. How do you think the rules of etiquette will change over the next 20 years? Will evites be acceptable as wedding invitations? Will social or eco-responsibility be more of a rule instead of an option?